In 2015, the Coast Guard gifted the second order Fresnel Lens from the Cape Elizabeth light tower to the Maine Maritime Museum (MMM). Barba + Wheelock were commissioned to design a new exhibit gallery for the lens, an addition to their iconic Maritime History Building, c. 1987. 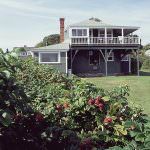 Because of the highly sensitive preservation needs of the historic Fresnel Lens, the addition is a “black box” theater. The addition is sited to be embedded in a developed courtyard inside the MMM complex. The building, in essence, is designed around the exhibit and creates an immersion experience for the public. While there are many lens displays in various institutions throughout the U.S., this is the first gallery of its type known where the lens is celebrated, interpreted, and set in an exhibit that simulates the visitor experience of standing on the lantern tower deck. Sound, sights, smells, and tactile references are all part of the design. The curator and architects worked closely together to create this experience with a parabolic screen as a key element of the design. 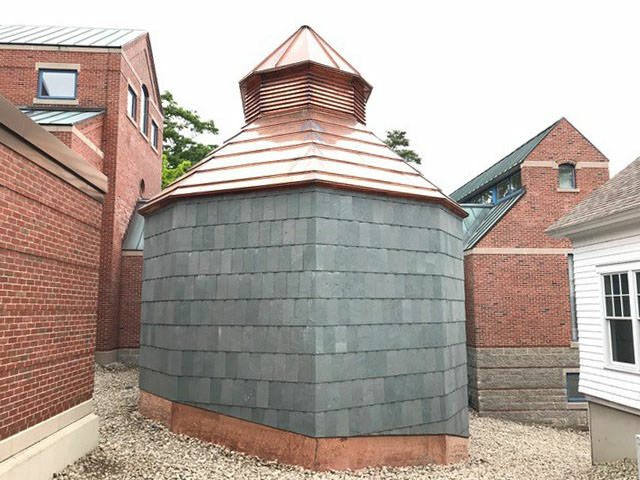 Not only designed around the exhibit, the addition fits securely within the tight parameters of the existing building and is clad in durable slate siding and copper roofing. Special Features: A black box theater designed for a singular exhibit.